A week ago, on my first night out on my own since Everett was born, I was on my way to a college mini-reunion in Manhattan, transferring from the E to the 6, when I got a text from Sue. "Did you make it into the city ok?" she asked, telling me there was a tornado warning and trees were down all up and down the street. I texted back that I was fine, I made it into the subway before the thunderstorm, and didn't think too much more about it. After a nice cocktail hour or two in a classmate's beautiful Park Avenue apartment, I texted that I was on my way home, got into the subway, and still wasn't thinking too much about it. Got out of the subway, went straight to the nearby ATM, took money out, then looked up - pretty much every street tree on Continental Avenue was toppled or broken. A big lighted sign had fallen off from above a bank's entrance. Branches were everywhere. "This must have been some storm", I thought. And I still had no idea. Once I crossed under the railroad tracks to my block, the scene got much worse. The street trees down on Continental were small, insubstantial things. On my block, giant hundred-year-old trees were toppled everywhere, blocking roads, leaning on roofs, crushing cars, and upending sidewalks. Dozens of them. It was indescribable. It was surreal. All the while I was in Manhattan, I had no idea that this was going on. "What in the hell happened here!!???" was how I greeted Sue. She told me that the thunderstorm rolled in, and soon the sound of thunder was continuous, it just didn't stop, with rain so hard she couldn't even see out the window. Then less than five minutes later, it was over. She didn't even know what was happening as it was happening! And she was just as astonished as I was that all that destruction could happen in such a short amount of time. It was truly a once-in-a-lifetime event, and I missed it! We spent the next few hours wandering around our block, which had become an obstacle course. Everyone was carrying a camera, snapping away. Strangers and neighbors we had never met before stopped to chat. Everyone was dazed and awed. And we soon discovered that our block was pretty much the worst hit around. *Every single tree* on the block between our house and the train tracks, and at least half of the trees a block in every other direction had fallen over or were fatally damaged. Yet a few blocks over it was almost like nothing happened. Well, relatively. 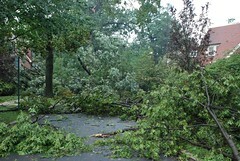 There were trees and branches down all over Forest Hills, but nothing like I saw on our block.